Government publishes lots of news. Every month, we add around 500 news stories to GOV.UK. We know from our metrics that large numbers of people are reading news content - there are roughly 4 million monthly page views for news stories and press releases on GOV.UK. Earlier this year though, we realised that we didn’t know as much as we’d have liked about the needs of this audience, and what they wanted government to provide. And so we set out to find a few answers, to inform the challenge of helping government adapt its news formats to a digital world. The first thing we looked for was a broad profile of the types of users who came to our news pages. To get this, we sent out a short survey to subscribers to our news email alerts - a group with particularly strong needs for government news. The answers, from more than 2,000 respondents, revealed the biggest user group to be government itself - central and local. There were also significant numbers of subscribers from private sector, academic sectors, or for personal interest. Media organisations - the people who publish news about the government, and for whom much government news is written - represented about 14% of the news audience. In our follow-up research, we carried out 11 one to one interviews with a selection of survey respondents, concentrating this research on non-media audience groups (see section on media needs below). For most users, government news updates were a crucial information source for their job, with many oversubscribing to make sure they miss nothing. Users just wanted straight facts from the government. When these are mixed with government narrative, they spend time picking out the facts. Users wanted to know more about the background to a story - for example, what informed a decision, how has it changed, where the references were. To all these users, finding out ‘what’s new’ from government seemed much more important to people than ‘reading the news’. They wanted practical, usable updates from government about changes to schemes or issues in which they had an interest - and following news on GOV.UK was simply a means to this end. Nobody we spoke to wanted to browse GOV.UK (in the same way they might follow the BBC, Guardian or Times) for pleasure or generally to keep up to date with events. Also, they tended not to notice - or care about - the format in which these updates were presented. They just wanted to know they had all the information. In this regard, some people expressed frustration with the way in GOV.UK currently separates out news stories and press releases. Analytics data tended to support what we found in the interview sessions. When we reviewed the most popular news stories published in specific months, roughly 80% of stories involved the presentation of factual information which came uniquely from government. During June 2014, for example, the top stories were about passports and the national minimum wage. At times, these could get pretty granular (eg, remote payment for the Dartford crossing). 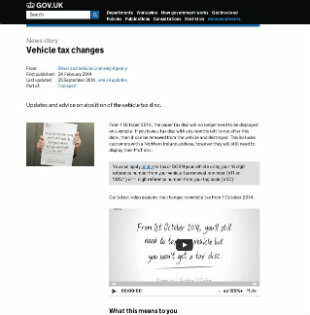 And our news page on tax disc changes has had more than 2 million pageviews so far - by some distance GOV.UK’s most popular news story ever. In this research, we concentrated on uncovering the needs of the 86% of the GOV.UK news audience who were from a non-media background. Government press offices expressed the view that media needs for news from government were often discrete (eg, for press releases in advance of an official announcment) and primarily addressed via non-web channels - email, phone briefings, social media, with GOV.UK only playing a minor element. We’d like to do more to properly understand and respond to this set of needs - we’re hoping to take this further with the help of the Government Communication Service. The user feedback we heard underlined the importance of GOV.UK’s commitment - expressed in our proposition and elsewhere - to provide people with fast, practical, clear and high-quality content about things that are important to them. We’ll be following up in a number of ways. First, we’ll be testing the extent to which audience needs for topical updates on a particular area matches with the wider needs for ‘specialist’ content on GOV.UK. This may involve some rethinking of our news formats. Second, we’ll keep working with content teams across government to ensure that news content is in line with what users need, and trying to share what works. 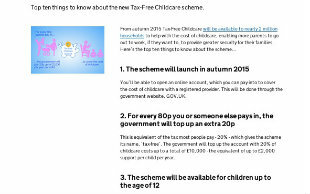 For example, we think HMT’s news article about tax-free childcare showed how a factual, clear style can still be engaging - and we’re happy to advise others who’d like to try similar approaches. Finally, we’ll be working very closely with government digital teams and the Government Communication Service to explore how we can support government's move beyond a 'press release by default' culture, and in doing so map out the type of news service that GOV.UK should offered in future. there is a real concern in the community of peopel who are interested in scrutinsiing govt about the way information is now presented.. First is one thing to make no judgement - but another just to give everythign equal status.. there is so much information it becomes useless. an example. earlier in the week I wanted to look at the way govt used research evidence. so I wanted to sample recent significant policy announcements. But the first page of .gov.uk announcements or publications covers just one day (and a day when parliament isn't sitting) but most are totally trivial. Impossible to work out what major stuff govt is doing. nor is .gov.uk any good for holding govt to account despite the emphasis on transparency. It is impossible to trace back the history of documents. In most cases you have to rely on whatever google searches turn up. this is bad not only for external observers but for those working in government. Institutional memory is already degraded -- external websites used to help. the migration to .gov.uk means that has now been rendered useless. I have given up on .gov.uk... what you do need is to create a parallel curated open filing system on the National Archive so we - and you- can really understand what govt is doing in our name. On sample size, I think we'd say that we tested with enough people to be able to be pretty confident in our findings. We've written more about sample size in this recent blogpost: https://userresearch.blog.gov.uk/2014/09/16/sample-size-and-confidence/. But the core point you make - that the volume of news published on the site makes it difficult to differentiate 'significant' things - is a really important one, and worth exploring further. (NB I hope others will share their thoughts on this too). One of the challenges with presenting news on GOV.UK is how we balance transparency with - for want to a better word - 'usefulness'. On the one hand, we think it's part of our role to be government's official record - that is, to be an comprehensive and transparent archive of everything published by the government, which users can search and filter according to their particular needs. But on the other, there are obviously some news announcements which have wider implications than others - those which announce changes to government schemes, etc - and there's a need to differentiate these. The 'featuring' slot on organisational pages (e.g. http://www.gov.uk/dfid) does allow a few of these bigger stories to be featured, but this only goes so far. To respond to this, we've begun thinking about how to separate the different 'types' of news, so that different groups of users get more of what they need. For example, we've been looking at how we can target users with 'specialist' needs of GOV.UK (for example, following tax guidance) with updates about things that are relevant - and vital - to them for their work, but are much less relevant to wider audiences. We might also want - with the help of the Government Communications Service - to look at the best approach to presenting news stories which are mainly aimed at re-use by the media, or the aim of which is to give a flavour of the work of a government organisations - for example, details of ministerial visits, reactive quotes and so on. It's often difficult to pinpoint a specific user need for this type of story; and much of this content works better on social channels than it does on GOV.UK. We're not going to find all the answers overnight, but we are really very keen to get all the feedback we can on what is - and isn't - working for you at the moment. I would wholeheartedly endorse Jill's comments: as someone who used to regularly haunt government websites (in a professional capacity), I have barely used gov.uk since departments switched over. There is, no doubt, enormous benefit in simplification - particularly for most circumstances in which people find themselves on a government website. I am sure most people don't care about the DFE org chart, say, or NHS PBR information for 2011-12. But some of us do need that information, and it's gone from being pretty accessible for the sort of (admittedly niche) people who want it, to either completely unavailable, well-buried and therefore only accessible through Google, or on an overly engineered new interface (the data.gov.uk org charts are atrocious). Now it may be reasonable to argue that my sort of requirements are too low a priority in a world where budgets are constrained, and digitisation is the priority. And the previous model of departmental website certainly had downsides in trying to meet everyone's needs. But I am sympathetic to Jill's point that the current format is inimical to both transparency and corporate memory. Thanks for your comment - really appreciated. When you suggest that 'my sort of requirements are too low a priority' that's absolutely not the case - it's incredibly important to us that people who come to GOV.UK with a specific need can find the information they're looking for quickly and easily. We're constantly learning about how we can better achieve this goal. Once we've gathered all the data we can - from our analytics, user research, the feedback people leave on the GOV.UK site and blogs like this - we work out what the most important things to address next are, and publish this information in our product roadmap. We then share this within government, and on this blog for comment (we hope is useful and vaguely intelligible - the most recent version is here https://insidegovuk.blog.gov.uk/2014/09/29/roadmap-update-monday-29-september/). We welcome any comments on our priorities, especially if you reckon we've got them wrong. And if you're having trouble finding specific stuff, drop us a line through our support form (https://www.gov.uk/contact/govuk) and we'll always try to help you out. Does that help? Hope so. We really do rely on you sharing your specific feedback about what's not working, so we can make things better. When performance tables are published, or new criteria for judging schools come into use (eg the Wolf progress measures) there should be great stuff in .gov.uk News to help people understand what it means for them. But this starts by having a good sense of what people need to understand/know. Thanks for your comment - we're maybe getting slightly off-topic, but that's OK.
Hopefully what's coming through in the above blogpost (and the comments) is our commitment to thoroughly understanding what people's needs are for information from government, and then responding appropriately. In the case of content for education professionals, we're acutely aware there's been room for improvement. Over the past 12 months, we've held dozens of interviews with people in the education sector to understand their requirements. In response to our findings, we've developed pages that try to pull information together in a way that users would expect (for example https://www.gov.uk/schools-colleges). Our development of these pages is still an ongoing process - and we're testing what we do every step of the way with users. As part of this, we're also looking at how to make news updates for specialist audiences meaningful, for example helping people who are just interested in following government announcements about, say, the National Curriculum, just get updates on this subject and nothing else. Hope that helps - if you'd like to continue this conversation in more detail, happy to do so - perhaps ping us your details at https://www.gov.uk/contact/govuk. Thanks for sharing this Graham - there are some compelling numbers in here, and it's right that we use them to ask ourselves questions about why we publish stuff. In health, we create lots of content that is created with reuse by journalists in mind, but we know that the correspondents we're targeting don't tend to use GOV.UK as a source. If it's the case that the style of that content jars with the people who are using GOV.UK to seek information, then publishing it might be counter-productive. It'll be tricky, but I think we can solve this. I will be speaking as a business person who uses (but is not subscribed to) GOV.UK to follow the latest government updates. I find it essential to know what's new and what advantages this can bring to your operation, employees, etc. These insights into what people need from news on GOV.UK helps understand the whole platform better.